Such a fun girl! She is incredibly wiggly and ready for anything! She never has anything but a smile on her face and adores all people. She may be too much for the little ones as she can be a hurricane of activity, but she doesn't seem to have a mean bone in her body. She gets on great with most of the dogs that come to the events with her and will be your BFF for just about any treat you may have. 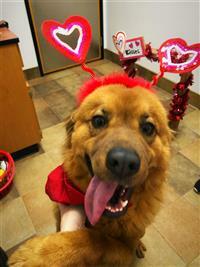 Come meet this charming ball of fluff and get ready to find out that red heads have the most fun!